From Napa Valley to Klamath, on the northern California coast. Day two of our trip was a day of stark contrasts. We knew on waking that our host at the B+B had promised a ‘gourmet breakfast’, but I wondered if the culinary delights of St Helena could possibly continue at such a high standard. We joined another couple for a truly gourmet breakfast, both courses announced with the liberal flourishes of our flamboyant host, Carlos. “Baked pink grapefruit with fresh raspberry coulis and spun honey.” Who would have thought to bake a grapefruit? Apparently, Carlos, and it was both unusual and delicious. Waffles! I thought I would die of excitement, and they were amazing. The kind of waffle that retains its crispy exterior, while pools of butter and syrup meld in the little pockets. Ben remarked later that I had shown great restraint, and he knew that if we were not seated opposite strangers, I would have clapped in delight at the overwhelming deliciousness. I clapped on the inside. Dinner was a distant memory as we finally moved from the table and finished packing. It was another beautiful day in the Napa Valley and we had quite a drive ahead of us up to the north coast of California, to Klamath. Our breakfast companions had informed us that Klamath is not on the coast (a surprise to us), and that Crater Lake was only about an hour from there (a happy surprise to us). We knew that if we made good time then we could get to Crater Lake before nightfall, a good addition to our itinerary. Bellies full as we drove off, we decided not to have lunch that day, but to snack in the car and have a ‘proper’ dinner. 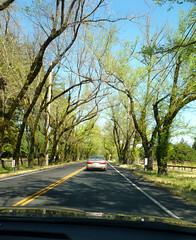 As we drove north through wine country, enjoying the sun and the landscape, we started an audio book Ben had brought. Bill Bryson’s A Walk in the Woods is his travel biography about walking the Appalachian Trail in the east. Although we were in the west, the changing topography (fewer fields, more forests), and the changing weather (grey clouds and drizzle), allowed us to be transported and enjoy the hilarity of Bryson’s huge endeavour. We made great time. We arrived at the Requa Inn, just out of Klamath, around 4pm, meaning we could make it out to Crater Lake. The sky in Klamath was clearer than other parts of our journey, a milky blue, and the air was cold. From the start of our day, the temperature had dropped 25° F.
The Requa Inn was opened over 100 years ago, and the eclectic mix of furnishings and knickknacks bore testament to the whole century. A collection of cricket paraphernalia caught my eye, as did their haphazard – yet extensive – library. I did not like, however, the creepy photograph of a long dead woman that hung just across from our bedroom door. I was compelled to look at it every time I went in or out of the room, even though she freaked me out. “It’s just an old photo. You’re only freaked out because you can’t see her face,” said the sceptic. Yes, exactly. It is not normal to have a black splodge where your face should be. Our host informed us as we checked in, that Crater Lake was a 6 hour return drive from there, and that the roads would be closed anyway, because of snow. “Oh,” we both said, disappointed we wouldn’t see the brilliant blue of the lake’s water, contrasted with its snowy rim. Who had told us that it was close? Oh, yes. Carlos, our B+B host. BUT, we could drive up the hill to go whale watching! We picked the innkeeper’s brain a bit longer, determining that we could drive south (back from whence we came) and drive into the Redwood forest, and that dinner was even further south (nothing open in Klamath on a Thursday night). We dropped our bags to our room, and drove the short drive to the lookout over the Klamath River inlet. Like the other gem we’d be told at breakfast, the line about Klamath not being on the coast was rubbish. We were in Klamath, and we were standing on the coast. It was spectacular. I pulled my jacket around me, and we sat on a picnic table and scanned the water for whale spouts. None emerged, but the salt air and the view were enough. We reluctantly drove away, promising each other to return in the morning. We were going to see big trees now. 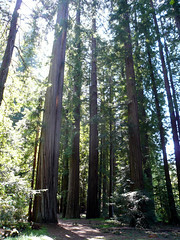 We had stopped earlier in the day, just pulling off the road, at our first real glimpse of Redwood trees. The sun was still out then, and we walked through a small stand down to a pebbly riverbank. This little glimpse into the world of giants whet our appetite for more, so when we took the turn off into Redwood National Park late in the afternoon, we were blown away. We saw a car parked ahead, and pulled off the road. 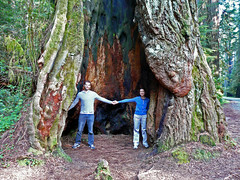 Another young couple was there taking fun photos of themselves with a giant hollowed out tree. We joined in on the fun, trading cameras and getting ‘couple/tree’ shots for each other. The air was cool, damp and smelled of centuries of nature. The other couple left and we explored further. The base of one felled giant stood taller than Ben and we estimated it at over 1000 years old. Back in the car, we made our way to “Big Tree”, the imaginatively named largest tree in North America. We parked, and walked the path, and narrowed ‘Big Tree’ down to two big trees. We took photos with both, marvelling at their height and girth. It was getting chilly and dark, and we wanted to drive to the beach before dinner. A dirt track took us to the stark and grey-sanded coast. The skies had turned grey and the wind was biting, but the untamed beach, awash with driftwood, was beautiful. We defrosted in the car as we drove back to the highway, and headed further south to Orick for dinner. We had been given the two big tips for dining in Orick. There was a Mexican restaurant (closed), and a biker diner (open). The diner was a beacon in the darkness, for we were starving, and had already decided that never again would we ‘car snack’ instead of stopping for lunch. The diner was warm and smelled like home cooking. It was the first true diner experience I could remember having, and our waitress was sweet and personable, through her obvious exhaustion. We ordered diner food: a French Dip and onion rings for Ben and a hamburger and fries for me – oh and a salad, so we could feel somewhat virtuous. The French Dip – for my Aussie and British readers – is a roast beef sandwich, which is dipped into a beef broth. Salty, hot and beefy. And a departure for Ben, who is (mostly) a white meat only boy. We devoured our food nearly before it hit the table, and it was delicious. I mentioned to Ben that we had gone from whole wheat Belgian waffles with organic Vermont Maple syrup to burgers, fries and onion rings, in one day. Another contrast to enjoy. The only question that remained after dinner was, did we have room for pie? Hell, yes! We took it go, mixed berry for me, and apple for Ben. Bill Bryson, earlier that day, had uttered a line that I now shared with our waitress: “Can you please cut me the biggest piece of pie you can without losing your job?” “I always do,” she winked conspiratorially. And when she handed us our pie to go, they were fat wedges, fillings oozing out the sides. I couldn’t wait to get back to the Inn. 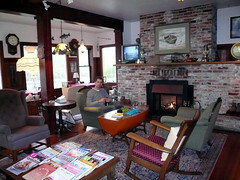 We were the only guests that night, so had the large living room to ourselves. We helped ourselves to a bottle of Moonstone Red (leaving a note for our hosts that we would fix them up in the morning), and sat by the fire. 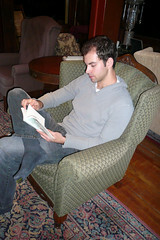 Ben read aloud from an anthology of Walt Whitman poetry, which casually sat on the coffee table. We drank wine, and ate THE BEST PIE I HAVE EVER HAD, and grew sleepy by the fire. A good day, and as different an ending as we could have imagined in the beginning. Tomorrow we would be hiking further into the woods, and then driving into Oregon – a first for us both. We collapsed, exhausted, and I dreamed of giant berry pie trees. Love your travel writing, Sandy! I iSounds likee perfect day. Still havin g trouble commenting as y you can see!